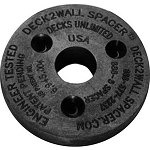 Deck2Wall Spacers are easy to install, simply fasten the spacer to the ledger with properly sized screws or nails through the attachment holes prior to bolting the ledger to the structure. 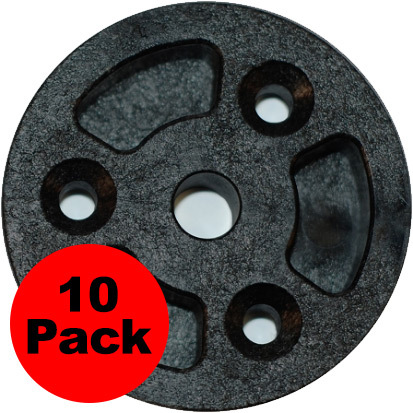 The large diameter of the Deck2Wall Spacers will provide greater bearing surface than standard washers. 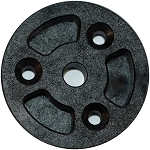 Deck2Wall Spacers allow machine bolts or lag screws to be positioned on a ledger as specified by an engineer or architect. Other methods may not offer this flexibility. Attaching deck ledgers is serious business. Failures can be disastrous. Consult a design professional if necessary. Use Deck2Wall Space for a fast and professional ledger installation. 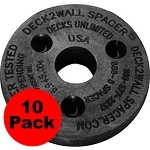 Use Deck2Wall Spacers with appropriate fasteners. Try our Bronze Star BTX-08112 Star Drive Screws.